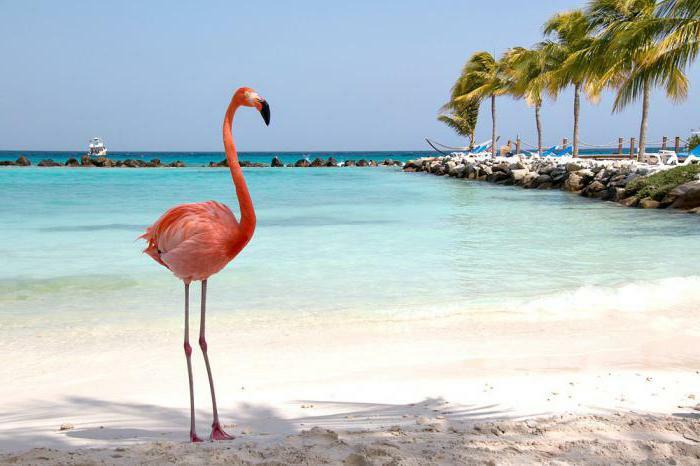 Flamingo - amazing birds that are found in nature. Similar to the herons and storks, they still have distinctive features that aren't typical of any other bird on the planet. First, it is the unusual color of the feathers, and second, bill. He bent, large and, in all probability, very powerful. Today we delve into the world of creativity and learn how to draw a Flamingo. 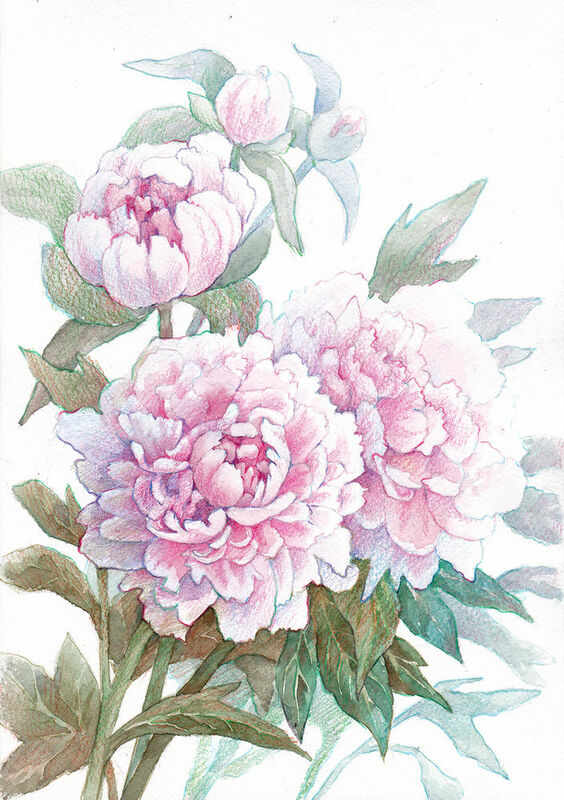 But in order to work at its best, you will need not so much: a good attitude, a certain amount of patience, concentration, a pencil and a sheet of paper. In the upper right corner of the sheet, note the location for future heads of flamingos. We should not forget that it is by no means impossible to do a large, or to draw a Flamingo as this will not work. Trying to portray a neat little oval, leaving enough space on the side under the bird's beak. By the way, an oval should be drawn as if it lies on its long side. 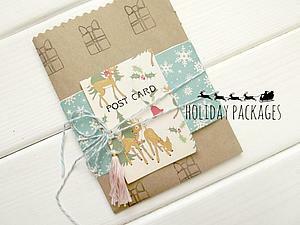 Then parallel to it will be similar shape, but much larger. Proceed to the next step, namely, begin to draw the body of the Flamingo. 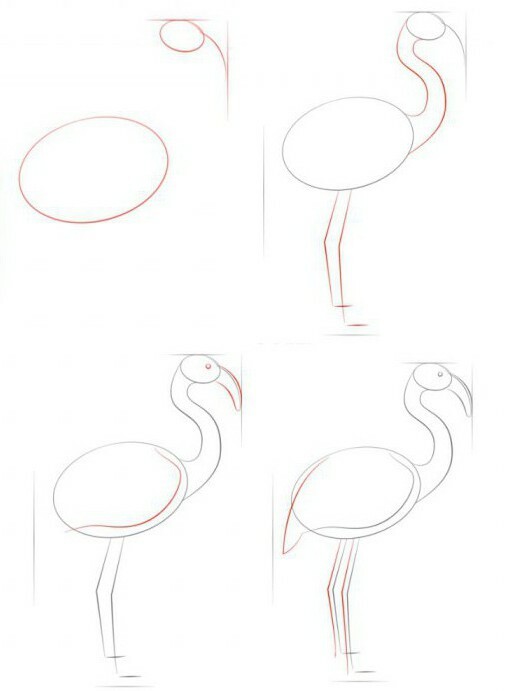 Below, from the first sketch, almost in the center of the sheet you want to draw the same oval shape that will later become the trunk of Flamingo. Don't overlook the fact that the figure needs to be large enough, because of this birds this part of the body the volume. Flamingo is not like the other numerous and variable, they have features that should be given attention. 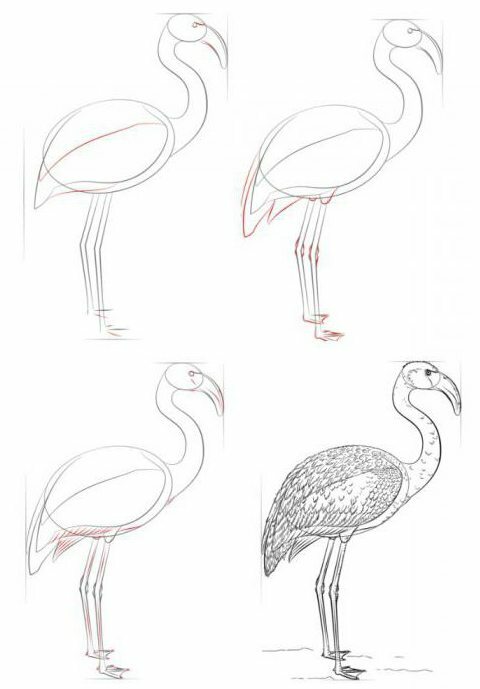 in order to draw a Flamingo as a living, that is to accurately replicate the smooth contours of his graceful curves, it should again look closely at the first photo presented in the article. Note the long neck of a bird, now, try as closely as possible to transfer what he saw onto a sheet of paper. Connect the top oval bottom with a smooth curved line and parallel to it carry out exactly the same. If done correctly, the neck Flamingo is ready. Final step in this stage is a picture of the legs of the bird. They are long with curved unusual side knees. Mark their outlines on the basis that the legs should take the same amount of space as is occupied by the head, neck and torso. Now proceed to drawing the bird's beak. The beak of a Flamingo charm. We will try to portray him correctly. To draw a Flamingo in pencil, as a professional artist, you need to carefully approach this part of the picture, because the pink handsome beak really special. He's a cross between a parrot "nose" and the beak of a Toucan. The main distinguishing feature of - signocast down. prepare the Wing on the bottom of a large oval smoothly beyond its contour in the area of the bird's tail. Next, draw the eyes. Remember, flamingos eyes small. Start with the legs of a Flamingo. This bird has webbed fingers, so clearly draw three fingers and put them at the top of the arc-shaped lines, curved downwards. Huge attention is paid to the knees of a bird. Their draw, as the junction of the two thin bones. All decorate small wing feathers, the tips of which are directed downwards. On the neck of the bird many feathers to portray, because to draw them like a Flamingo this still will not work. In nature the pink handsome in this part of the body feathers are very dense and creates the impression of a completely flat surface. From the eyes of the birds beak is to hold the line in order to leave this place white color not painted. Such a move will bring a maximum draw of Flamingo to the original. your drawing is ready. 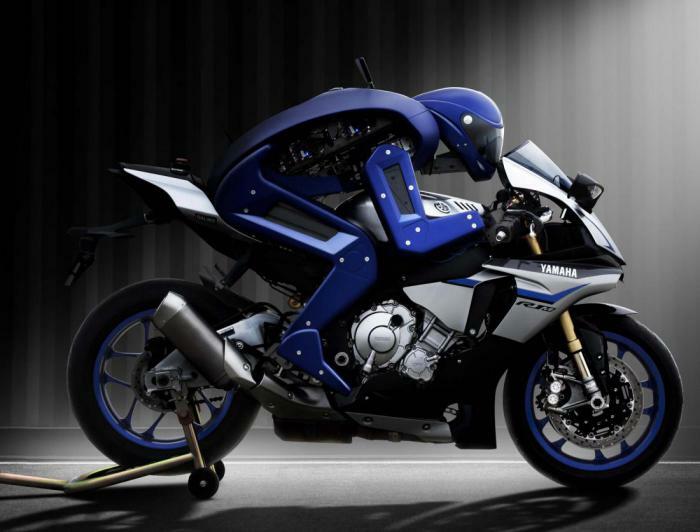 It remains only to give it the desired color.